Sean joined the firm in 1990 and was appointed Partner in 2006. 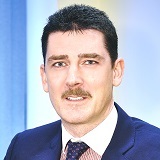 Sean provides accounting, taxation and financial advice services to clients across many sectors, including construction, manufacturing, medical, leisure, agri-business, retail and distribution. He has extensive experience in dealing with financial institutions on behalf of clients and advising clients with regard to Revenue Audits. Sean also provides advice to business start-ups with the completion of bank loan proposals for new finance, personal and company pension opportunities and tax planning.